… is the Great Barrier Reef! You might think coral looks like a plant. Or perhaps like a brightly colored rock formation. Well, look again! Coral is a form of marine animal. To be more accurate, it is a collection of tiny marine animals that grow together. These tiny creatures are called Coral polyps. They eat, breed and die, just like other kinds of animals. Together, all living side-by-side, they create a kind of larger structure, which we know as coral. Though coral polyps are quite tiny — only a few millimeters by a few centimeters each — once you get a few million together, they work up quite an appetite! The coral diet ranges from microscopic plankton and algae to smaller fish. Coral gets all its food by sifting through the water, which is why it is very important to protect the ocean from pollution and yucky gas motors. Coral reefs are sometimes called “rainforests of the sea.” This is because they are the home to so many different types of sea creatures. Up to 25% of all marine species in the world live among coral! The largest coral reef system in the world is the Great Barrier Reef, off the east coast of Australia. It is believed to be over 20,000 years old! It covers over 133,000 square miles — it’s so big that astronauts can see it from space! The Great Barrier Reef is home to 1500 species of marine fish, between 5000 and 8000 species of mollusks, 600 species of echinoderms, 17 species of sea snakes, 1500 species of sponges, 30 species of whales and dolphins, 6 species of marine turtles, and much more! 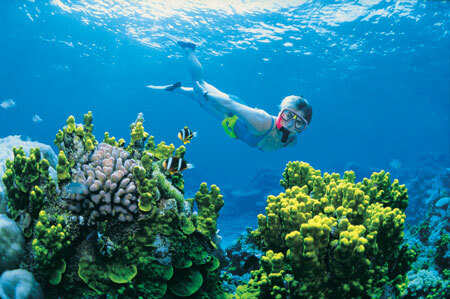 The Great Barrier Reef Marine Park is a wonderful place to visit. Though many parts of the reef are too sensitive for people to disturb, there are many parts that be reached by boat or even by swimming. Be sure to bring your snorkel, because you won’t want to miss those sights! One of the greatest threats to the Great Barrier Reef is climate change. Unfortunately, coral is very sensitive to changes in water temperature. Even the slightest increase can lead to distasterous effects! Almost ever year, the Reef has experienced serious coral bleaching, a process which colorless and lifeless. Read more about the environmental threats to the Great Barrier Reef, and learn about what you can do to help, here.